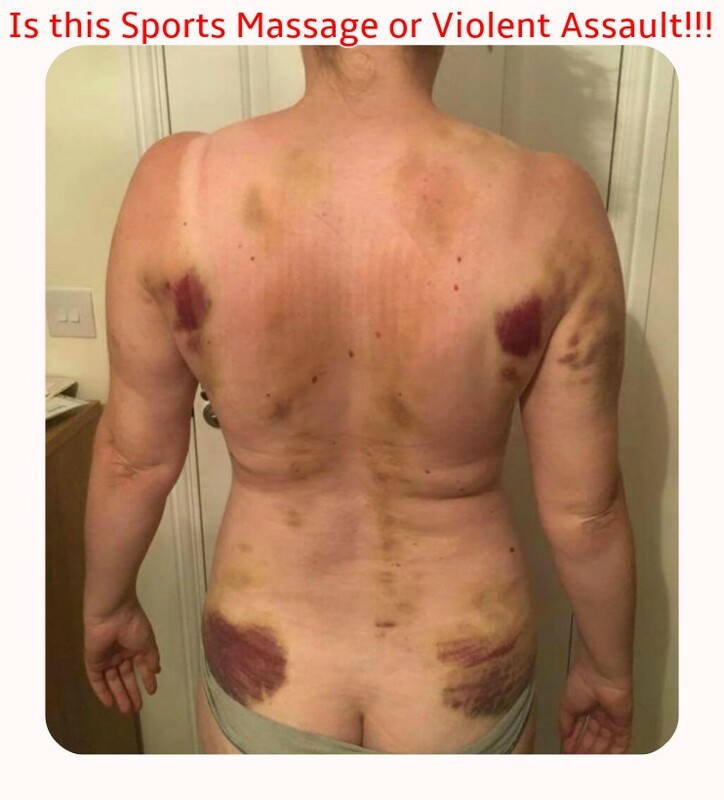 This picture shows the shocking result of a ‘Sports Massage’ and although it may be an extreme example it shows what can happen. This is because the sector is unregulated with some people doing sports massage based on very poor training. There are some online massage courses without any classroom practice and other ‘intensive’ courses that take just a few days. Some courses should describe what they teach as BRUTAL massage because that’s what it is. So if you go for any massage, beware! Or this could happen to you. Ask about the therapist’s qualification which should at least have a recognised educational Level. Level 3 is equivalent to GCSE and is only really suitable for general relaxation and therapeutic massage. Level 4 is equivalent to a school A level and will include some more advanced techniques. Level 5 is equivalent to an undergraduate level and this should enable the therapist provide very competent massage to deliver a proper assessment and treatment for minor injuries. They should be a member of a professional association so you know who you could complain to if you are unhappy with the treatment. You should also ask if they have professional indemnity insurance to practice. Although deep massage can sometimes be painful this should only happen where there is some sort of muscle injury. This should NEVER be intolerable or cause deep bruising (as seen here). A well-qualified therapist will often use tolerable levels of pain on a therapeutic level and this should feel like a ‘good pain’. Massage can be extremely beneficial but without any regulation you have to be very careful to make sure you get properly safe treatment.